« Care and Maintenance of the Body 101: What You and Dogs Have In Common. Caveman, Put Down Your Club, and Go Fishing. Today we ask you to meditate on the difference between the angry caveman and the serene fisherman. What comes to mind when you imagine a caveman? Perhaps you think of a rather brutish fellow, yelling in an incoherent language. A violent fellow, who goes about clubbing women and other cavemen into submission. This is not an accurate portrait of your actual ancestors, but it suits our purposes. For our purposes, imagine this brutish fellow with a club. Now: imagine a serene fisherman. He casts his well-made line with care, and precision. Then he sits back, and patiently waits for the fish to come to him. It is okay if the fish does not come for a long while, or even that day. He enjoys the scenery, enjoys the wait. And he knows that sooner or later, if he keeps fishing, a fish will come. So hold these two images in your mind: the angry caveman, and the serene fisherman. 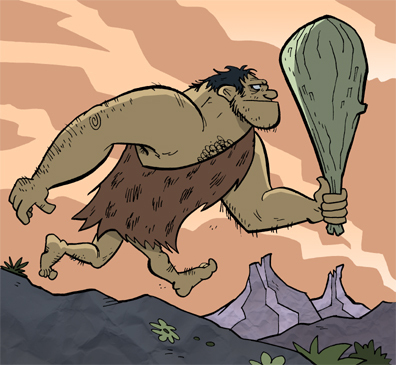 Most people, in their daily lives, are like the angry caveman. They wake up in a funk, grumpy and irritable. Before they leave home, they grab their clubs. And they spend their days screaming at themselves and everyone else. They may not scream out loud. They may be outwardly quiet people. Even so, inside they are screaming. Their inner angry caveman is running amok, trying to club the whole world into submission. Everything is a problem that must be beaten into shape. The angry caveman is always trying to “make things happen.” He’s here to “maximize potential” — his, and everyone else’s. And if that potential isn’t maximized — out comes the club! Here’s the bad news, angry cavemen. Humans have now reached a point in their evolution in which this angry, hostile way of being must go the way of the Neanderthal. There is another way of being and doing: and this is the way of the serene fisherman. For the serene fisherman, it is all about the set-up. You put energy into finding a good fishing spot, and in crafting your lure, your line. This is essential. In life, this is like keeping your mind and body in good health, and putting your energy into areas that are a good match for you. That is your good fishing hole, your good line. Once the fisherman has set himself up, he simply waits. He does not expend an ounce of energy unnecessarily. He waits patiently, knowing that the fish will come. And when it does, he moves into action. He has plenty of energy to take action when the correct moment arises, because he hasn’t been wasting it. This is in contrast to the angry caveman, who is always swinging his club about and bellowing. So that when the wildebeest comes into range, he is too tired to bring down the game and feed his tribe. He has exhausted his resources so that when the time comes to take action, he is clumsy and spent. So these are two ways of being. The angry caveman, and the serene fisherman. They are equally valid ways of being. But the caveman is angry. And the fisherman is serene.